It was pretty clear for a while now that the race to Best Picture would be between Birdman andBoyhood, two pretty important and impactful films. Boyhood seemed to be the favorite for quite a while, but in a pretty big surprise it came away with only one single Oscar, while Birdman swept with six awards including best director and best picture. Did the Academy make the right choice? First let’s be clear: this isn’t one of those cases where the Academy makes a baffling pick that is long remembered and mocked, like How Green Was My Valley beating Citizen Kane or Crash beatingBrokeback Mountain. Birdman and Boyhood are both absolutely worthy films which deserved to be recognized. But I don’t think Birdman was the best choice, and it’s not a movie that will probably stick with me in 10 years. When I think of 2014, Boyhood is the movie that will come to mind. It was the greatest cinematic achievement of last year, and even aside from its ambition, I think it’s just the better movie overall. First, let’s talk about the merits of both films. 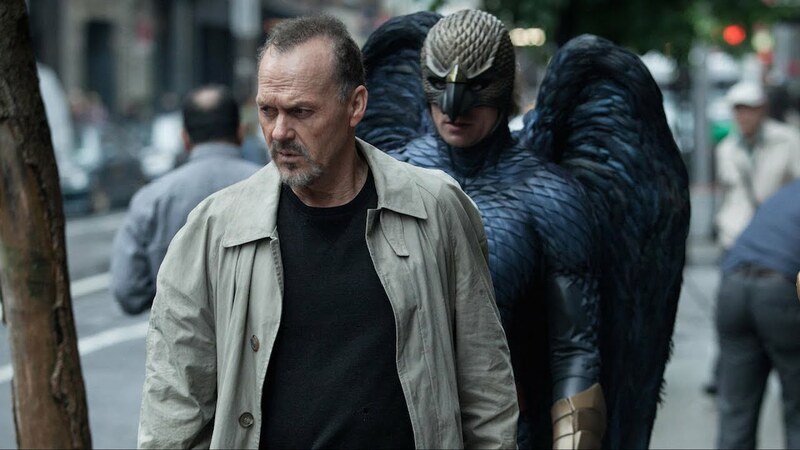 Birdman is stunning on a technical level, filmed to appear as one long continuous shot. Scenes go on for 10 or 15 minutes at a time, giving the movie the feeling of live theater. I couldn’t help but be amazed seeing the camera follow so much action in one shot or go through a window and have the scene continue without a cut. It’s also extremely well-acted, with no real weak link in the performances. Michael Keaton gives an unbelievable performance, as do Edward Norton and Emma Stone. It’s also a movie that is so ambitious and weird that I’m really happy to see it gaining Oscar recognition. This is far from Oscar bait. As much as I really enjoyed movies like The Imitation Game and The Theory of Everything, giving best picture to either of them would be pretty expected and safe. Birdman is a strange movie that tries to do a lot, and even if it doesn’t always succeed, sometimes a movie that’s messy but ambitious is more interesting than a movie that’s good but safe and predictable. Boyhood is also a technical marvel, famously being filmed over the course of 12 years. The fact that Richard Linklater was able to pull a project off like that at all is praiseworthy, let alone that it actually comes together to be a great, cohesive movie. It’s also extremely well acted, with really incredible performances by Patricia Arquette, Ethan Hawke and a pretty underrated one by Marco Perella. It’s really hard to compare these movies to each other, as they’re both trying to do completely different things. But with Boyhood, Linklater was able to pull off a movie that is both grand and intimate, both universal and personal. It’s a movie that’s great in a subtle way, rarely striking you with one huge, bombastic scene but which just feels completely natural and which adds up to an incredible whole picture. It’s the closest I’ve ever seen a movie come to emulating what life is like. Scenes are important in a small way. Our lives aren’t filled with giant performances and monologues that would be clipped out and played at the Oscars. They’re a series of small moments that don’t feel like anything as we’re experiencing them, but which we reflect upon later as being filled with great meaning. Overall then, Boyhood is a movie that says so much about growing up, love, dreams and time, which makes us reflect upon our own life and personal relationships, but it does all this in a subtle way. Never do characters vocalize the movie’s themes; Linklater simply lays out this life, and it’s actually more effective and emotional because it’s so minimalist. The final scene with Patricia Arquette is incredibly moving and emotional, and her line “I thought there’d be more” says so much with just five words. On the other hand, Birdman has a lot of ideas, but it’s far from being subtle. There’s barely any theme in the movie that isn’t spelled out in the dialogue. Hey guys, superhero movies are destroying art and culture! Do you get it? Michael Keaton goes on a rant about how kids just want to tweet and live-blog their life. A theater critic gets into a debate with Keaton’s character, Riggan, where we’re hit over the head with how evil critics are. Hey look, Riggan is more popular when he’s running around the streets in his underwear than when he’s producing valuable art! Get it? Its storytelling is also kind of messy and overstuffed, complete with a weird subplot involving a lesbian romance that goes absolutely nowhere. For a movie meant to indict Hollywood for only making superhero movies, which are full of obvious, unsubtle writing, Birdman sure has a lot of obvious, unsubtle writing. Don’t get me wrong, I really enjoyed Birdman as a character study, and I think the movie is mostly successful. But it isn’t without its problems, and the fact that it achieves so much doesn’t mean these issues should be ignored. It may feature great performances and give us a lot to think about, but it’s also pretty messy and in your face. But hey, it’s a movie about how amazing and important show business is, and the Academy loves that. Boyhood is a movie that’s three hours long, but I couldn’t imagine cutting a single scene. Everything from Mason getting a haircut or discussing movies with his dad feels so important. It’s such a natural movie that doesn’t need to be so big and direct in order to make an impact. By the end of Birdman, I felt like I had been talked at about the movie’s themes, whereas at the end of Boyhood, I felt like I had actually experienced them. Birdman is definitely a movie with a lot of merit, and I’m not tremendously upset that it won the award for best picture. It’s probably one of the most interesting and different picks in a long time, whereas the last batch of winners – The King’s Speech, The Artist, Argo and 12 Years a Slave – were all pretty safe picks. But Boyhood really is the better movie. It shows rather than tells, giving us this experience of growing up which has barely any big scenes but which makes a huge impact. Meanwhile Birdman often works and ends up being a pretty successful film, but it’s too often unsubtle and messy, like it’s throwing so much at the wall and a good amount of it just doesn’t stick. In 10 or 20 years Boyhood, notBirdman, is going to be the movie that really stays with us and which will truly stand the test of time. February 23, 2015 in All Movies.